For other uses, see Glamour (disambiguation). Glamour is a women's magazine published by Condé Nast Publications. Founded in 1939 and first published in April 1939 in the United States, it was originally called Glamour of Hollywood. Local editions are now published in numerous countries including the United Kingdom, United States, France, Italy, Germany, Spain, Russia, Greece, Poland, South Africa, Brazil, Hungary, Romania, Bulgaria, Netherlands and Mexico. In most cases it is a monthly publication. In August 1943, the magazine changed its name, to Glamour with the subtitle of for the girl with the job. The magazine is published in a larger format than many of its counterparts. Its current editor-in-chief is Cynthia Leive. It targets women 18–49 (with the median age of 33.5) and reaches a subscription audience of 1,411,061 readers in the United States. Its circulation on newsstands is 986,447, making the total average paid circulation: 2,397,508. Glamour was the first women's magazine to feature an African-American covergirl when it included Katiti Kironde on the cover of its college issue in August 1968. Since 1980 the magazine has held an annual "Women of the Year" awards ceremony. In April 2009, Glamour launched its first Google widget. iGoogle, which allows users to create a custom version of the Google home page with select regions of content, or “gadgets,” will begin hosting a gadget for Glamour.com. The Glamour.com gadget potentially opens the site to an audience of iGoogle users. Each autumn, the magazine organizes the “Glamour Woman of the Year Awards” which recognize women in the public eye. In 2007, Lorena Ochoa won a Woman of the Year award. In 2008 the award was granted to two Yemenis: 10-year-old divorcee Nujood Ali, and the lawyer who took on her case. Nujood's courage was praised by prominent attendees, including Hillary Clinton and Condoleezza Rice. The 2010 Glamour Woman of the Year was Cher and the 2016 Glamour Woman of the Year was Zendaya. Each year for the last 56 years, the magazine has been selecting a top ten list of outstanding college women across the country. Originally, the list was composed of the best dressed college juniors in America, but was changed for more substance with categories such as academic achievement, community service, and career goals as leading criteria. Hundreds of college juniors apply each year. Past winners, finalists include; Martha Stewart, Diane Sawyer, Swati Mia Saini,<ref name=name = "MIT_Magazine2004> Brehm, Denise (September 10, 2004), "Two MIT students make Glamour magazine's Top 10 College Women list", MIT News, Massachusetts Institute of Technology, retrieved April 9, 2010 </ref> Nancy Amanda Redd, 2003 Miss Virginia (MAO) and author of Body Drama, and Tamira A. Cole, Miss Black Kentucky USA 2009 and author of HUSH, actress Sheryl Lee Ralph and novelists Curtis Sittenfeld, Kate White, Janice Kaplan, Olympian Allison Schmitt, and Jean Hanff Korelitz. Glamour launched in the UK in April 2001, where it pioneered the “handbag size” format, with the tagline "fits in your life as well as your handbag". Each September the magazine holds “National Glamour Week”. Consequently, the magazine features extra coupons (e.g. redeemable at fashion or beauty outlets) and competitions. Since its launch the magazine has been edited by Jo Elvin, with Michelle Pamment serving as acting editor briefly in 2005. 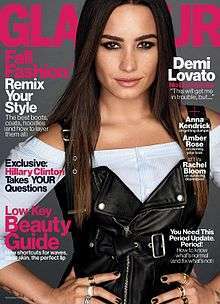 In June 2009, to celebrate Glamour's 8th birthday in the UK, Glamour.com have made a gallery of every cover since launch. The German edition is published fortnightly and was edited by Andrea Ketterer in March 2005. The Italian edition of Glamour was launched in December 1976, under the title Lei (She). It was not until 1992, when the magazine was officially renamed Glamour, like its U.S. counterpart. The Russian edition was established in 2004 and it is published monthly in the country. The South African edition launched in April 2004, is published monthly and is, since its inception, edited by Pnina Fenster. In Germany and Greece Lucky, a fashion and shopping magazine is published seasonally, in tandem with Glamour. Lucky magazine is being shut down, drawing a close to a media story that started 15 years ago when Condé Nast launched the then-controversial but ultimately wildly successful shopping magazine. A copy of it was the magazine to which George Costanza (Jason Alexander) masturbated on the series Seinfeld, when he was caught by his mother in the season 4 episode "The Contest". ↑ "eCirc for Consumer Magazines". Alliance for Audited Media. June 30, 2013. Retrieved December 11, 2013. 1 2 Katie Heimer (April 14, 2009). "The Early Years of Glamour Magazine: Changing Constructions of Glamour, Fame and Femininity" (PDF). Katie Heimer Academic Works. Retrieved August 15, 2015. ↑ Pous, Terri. "11 Groundbreaking Fashion Magazine Covers". Time. ISSN 0040-781X. Retrieved 2016-04-06. ↑ "Glamour launches in 1939". Retrieved 13 December 2014. ↑ Jukka Pietiläinen (2008). "Media Use in Putin's Russia". Journal of Communist Studies and Transition Politics. 24 (3). doi:10.1080/13523270802267906. Retrieved 29 November 2014.